The upper back jaw (molar and premolar area) has traditionally been one of the most difficult areas to successfully place dental implants due to poorer quality of the bone that grows in this area as well as the close proximity of the maxillary sinus, an airfilled space within the upper (maxillary) jawbone. The issues with the quality of the jawbone have largely been addressed by implant manufacturers through advances in the surfaces the implants utilized today. Microscopically roughened implant surfaces maximize the amount of bone that can contact the implants which increases the success rate of implants placed in this areas of the jawbone. The maxillary sinuses are cavities in the skull located behind the cheekbones, directly above the upper teeth. The actual evolutionary purpose of sinuses is unknown but there are several theories including reduction of the weight of the skull, acting as sound chambers to make the voice louder, humidification of the air, or even as crumple zones to protect the brain from trauma in the event of an injury. The floor, or base, of the maxillary sinus is generally located near the ends of the roots of the upper molars and premolars. If you’ve lost bone in that area due to periodontal disease or tooth loss, you may be left without enough bone to place implants without a secondary bone grafting procedure referred to as a sinus elevation or sinus lift. A sinus elevation procedure can help correct the problem of having too little bone for the placement of an implant by elevating the skin-like tissue that lines the sinus floor and placing a bone graft under the elevated tissue to gain additional height. Several techniques can be used to raise the sinus and allow for new bone to form. When at least 5 mm of jawbone is present below the base of the sinus cavity, Dr. Wilson can often perform what is called a crestal (or internal) sinus elevation. To perform this procedure, Dr. Wilson prepares the implant site as he would anywhere else in the mouth except to a more shallow depth. He will limit the depth to a postion near the base of the sinus. 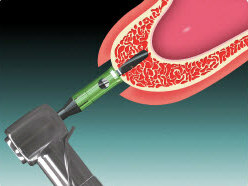 He then utilizes a special drill attachment that can cut the bone at the base of the sinus but not penetrate through the skin-like sinus membrane. Once the sinus membrane has been exposed, it can be further elevated hydraulically through the introduction of the bone graft. 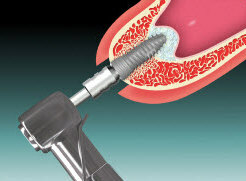 Once sufficient bone height has been established, the implant can be placed during the same surgery. A crestal sinus elevation procedure can usually be performed when only a few millimeters of additional bone height need to be regenerated. Step 2: He then uses a special drill tip that will cut bone but not soft tissue allowing Dr. Wilson to safely access the sinus membrane and begin elevating it. When more than a few millimeters of bone height is necessary, Dr. Wilson utilizes a procedure know as a lateral wall sinus elevation to regrow the needed bone. Following an incision, a small circle is cut into the bone on the side (or lateral) wall of the sinus. Care is taken to not injure the skin-like membrane that lines the sinus. This bony "window" and the attached membrane are pushed inwards towards the hollow sinus much like a trap door. As the window and the membrane are pushed inwards, Dr. Wilson carefully separates the membrae from the bony floor of the sinus so that it can be elevated upwards. The space underneath the elevated membrane is filled with bone graft material. Finally, the incision is closed and healing is allowed to take place. Depending on your individual needs and the amount of bone being regrown, the bone usually will be allowed to develop for about six to nine months before implants can be placed. After the implants are placed, an additional healing period is usually required. 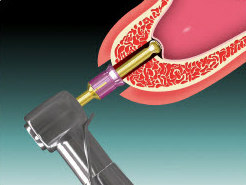 In some cases, the implant can be placed at the same time of the sinus elevation. Sinus elevation has been shown to greatly increase your chances for successful implants that can last for years to come. 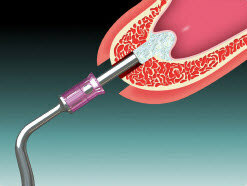 Most patients experience minimal discomfort during this procedure. In the case shown above, the patient presented to Dr. Wilson with a retained "baby" tooth being held in place by only by a small portion of the root. Because an adult tooth never developed to stimulate the bone, the patient's maxillary sinus expanded to a point where no bone was present for the placement of a dental implant. 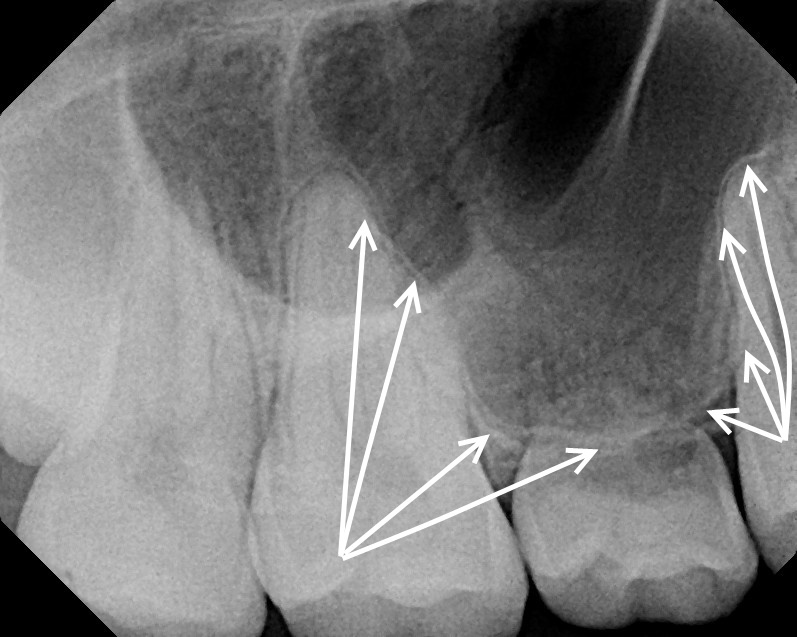 The first x-ray shows the expansion of the sinus cavity as outlined by the white arrows. The yellow outline in the second x-ray shows the bone that grew following a lateral wall sinus elevation procedure. The second film was taken 9 months after the procedure. The final x-ray shows the implant placed into the grafted bone right before the patient's doctor fabricated a crown for the implant. Note how the bone graft was confined by the walls of the sinus next to the two adjacent teeth and by the sinus membrane above the imlpant (creating a domed shape).